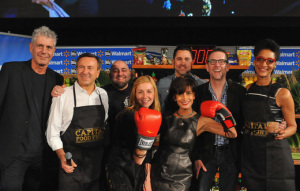 Who’s Up for a Capital Food Fight? 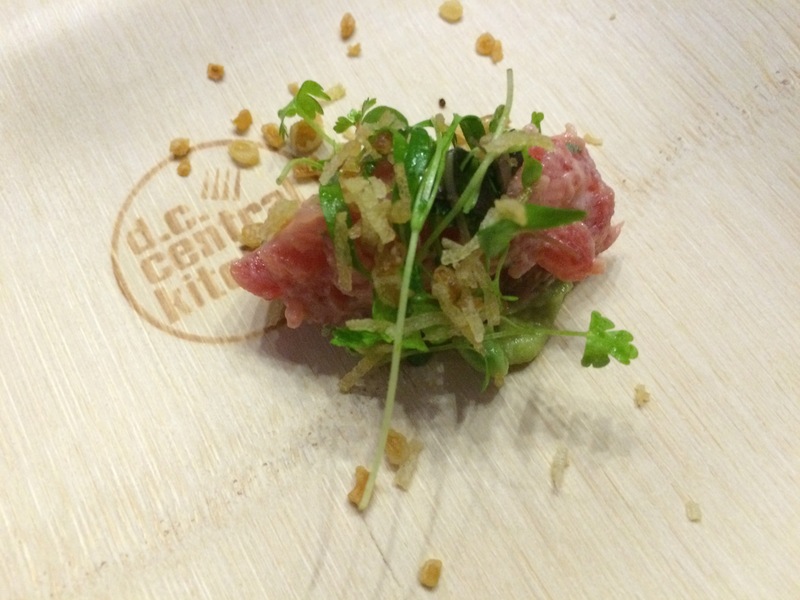 November marks the 25th anniversary of the DC Central Kitchen. The Capital Food Fight is an annual fundraising event for DC Central Kitchen, which is America’s leader in reducing hunger with recycled food, training unemployed adults for culinary careers, serving healthy school meals, and rebuilding urban food systems through social enterprise. This year’s event was held Tuesday, November 11, at the Ronald Reagan Building. Ripple and Roofers Union Executive Chef Marjorie Meek-Bradley took home the top honor in the Capital Food Fight. Chefs Frederik De Pue (Table), Tim Ma (Maple Ave Restaurant, Water & Wall), Marjorie Meek-Bradley (Ripple and Roofers Union) and Javier Romero (Taberna Del Alabardero) created dishes judged by some of the biggest names in the culinary world: Daniel Boulud (DANIEL), Ted Allen (Food Network’s “Chopped”), David Guas (Travel Channel’s “American Grilled”), and Christina Tosi (Momofuku Milk Bar). Anthony Bourdain (CNN’s “Parts Unknown”) and Carla Hall (ABC’s “The Chew”) emceed the 11th annual occasion. 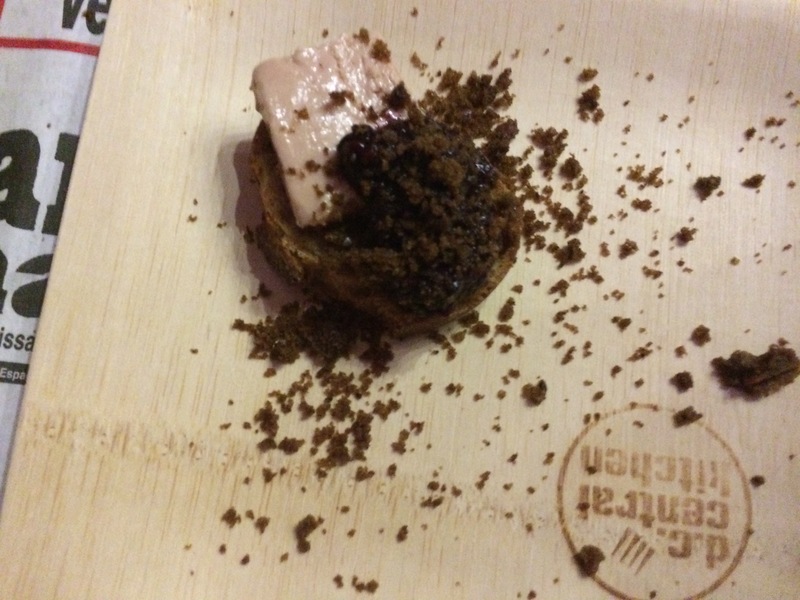 The event raised over $700,000 for DC Central Kitchen, which earns 60 percent of its $13 million annual budget through social enterprise ventures that employ at-risk adults to serve healthy food in DC. A highlight were tastes from 75 DC restaurants. There were pork dishes galore, and quite a few chefs featured tuna as well. 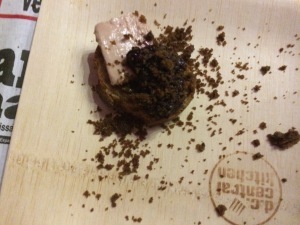 Favorites included tuna tartare from 2941 Restaurant and foie gras with huckleberry mustard from Le Diplomate. 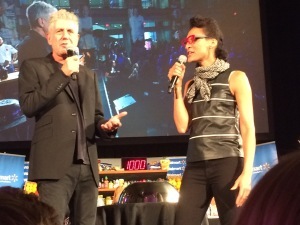 Carla Hall and Anthony Bourdain do their part in making it a fun event with their witty repartee. 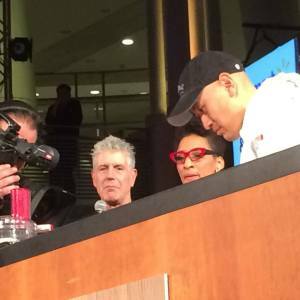 Bourdain got in a few digs at pastry chefs (telling Duff Goldman from “Ace of Cakes” that he doesn’t like them, and at DC restaurants by saying a dish would cost $29.95 in NYC and $17.50 in DC. It was all in good fun. The High Stakes Cakes competition celebrated its second year at the 2014 Capital Food Fight, bringing a cake decorating battle between four local pastry chefs on a parallel stage. Pastry Chef Melissa Payne (Couture Cake Creations) won the top prize for her three-tier cake design that included DC Central Kitchen recipe cards for each program, a detailed DCCK delivery truck, and a basket of healthy fruits and vegetables that together represented the key components of DCCK. On the heels of the Capital Food Fight, DC Central Kitchen will tomorrow (Nov. 12) kick-off an online fundraising partnership with Groupon in an effort to raise $25,000 in grassroots donations. Every $10 gift made to the Groupon campaign through the end of November will be matched by a $5 donation from the AARP Foundation, which will provide up to $12,500 in matching funds. Groupon will host DC Central Kitchen’s fundraising campaign through #GivingTuesday (Dec. 2), the global day of giving back. All funds raised by the Groupon campaign will be used by DC Central Kitchen to provide nutritious, balanced meals to underserved, at-risk DC residents. For every $10 raised, DC Central Kitchen can prepare and distribute four locally sourced meals that will go out to over 88 nonprofits around the city that have programs to help people gain work, overcome addiction, or learn new skills, compounding their potential to rise out of poverty. Visit the Groupon campaign page to learn more about or contribute to the campaign.